Bodysurfing is about as “back to nature” as a sport can get. It’s just you and the waves, surfing in its purest form. 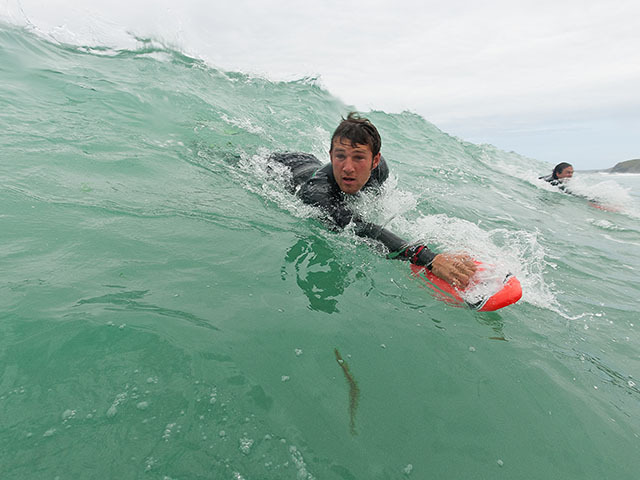 With no board to worry about you can throw yourself into the waves, drawn along inside the curl as the cool green water pitches above your head. The only drawback is that your body creates a lot of drag, so pull on a pair of fins to power you along and a hand plane to raise your torso out of the water, and it becomes possible to ride the waves for much longer. Out in the pristine chest-high waves with Josh, my instructor from Watergate Bay’s Extreme Academy, the first thing I notice is how good a workout it is. There’s lots of swimming, but after an hour in the sea I have lost count of how many waves we have ridden – easily double the number I would catch in an average surf session. A two hour introduction to hand planing lesson (including all equipment) costs £20 with the Extreme Academy, Watergate Bay. To hire a hand plane and fins it’s £6 for two hours or £12 for a full day.